Q: When is a bike lane not a bike lane? A: When it’s got cars, vans, and trucks parked in it. Unfortunately, that often seems to be the case with the bikeway on Upper Randolph by Millennium Park, which is the primary cycling route to the Millennium Park bike station. A chartered mini-bus parked in the curbside lane. Photos recently taken by Streetsblog Chicago readers suggest that it’s common for security guards, delivery personnel, tour bus drivers, and others to block the bikeway on the south side of Upper Randolph, especially near the Harris Theater. The fact that traffic cones are sometimes left in the bike lane to save parking spots suggests that the park’s management and police unofficially condone this technically illegal practice. Looking east on Upper Randolph, south of the Harris Theater. While the buffered bike lane is delineated with flexible plastic posts, they’re so far apart from each other that it’s easy for drivers to pass between them to enter the bikeway. The Chicago Department of Transportation tried to address the issue in recent years by moving the curbside bike lane to the left just south of the theater to create a legitimate loading zone. But larger trucks and buses near the theater still extend into this non-curbside portion of the bikeway, and further west the curbside bike lane often totally blocked. Looking west, tour buses block the curbside bike lane on Upper Randolph. A second bike lane, to the right, leads to new bike lanes on Middle Randolph. Obviously, the city needs to accommodate the many deliveries and drop-offs to the park, but there’s got to be a better way to do this without creating unsafe conditions in a key bike route for much of the day. One possible solution would be to install concrete curbs to the left of the curbside portion of the bike lane, an approach that’s becoming increasingly common in Chicago. Then all deliveries and drop-offs would have to be made further east, in the portion of Upper Randolph that has a legal loading zone. Yes, some deliveries would require rolling items further on dollies, and tourists might have to walk a little more. But if the change prevents even one person on a bike from getting seriously injured or killed while merging into traffic to avoid an illegally parked vehicle, isn’t that worth a few extra steps? 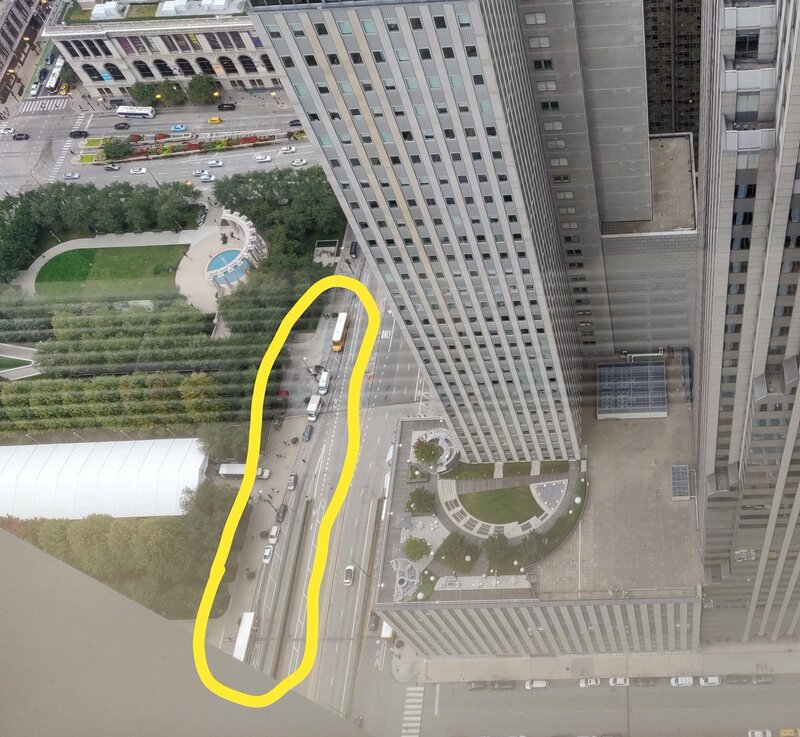 I thought all of those large vehicles (certainly the deliveries, possibly the passenger dropoffs as well) were supposed to be routed to Lower Randolph in the first place? I doubt passenger dropoffs are supposed to go to Lower. There aren’t standard public entrances down there. The deliveries, there’s no excuse. The city needs to tell the delivery drivers to take their trucks downstairs. They simply shouldn’t allow deliveries at the upper entrances. I have in the past encountered theatergoers down there while taking the don’t-cross-the-street-three-times route to Millennium Park, but maybe not an entire charter bus of them. But with the McCormick Place bus route right there, how is Lower Randolph not the appropriate place for charter buses to hang out? Yes, the entrance to the busway is down there, but the buses that use it go to hotels from there. They don’t stop at the end on lower Randolph and dump a load of conventioneers. Hang out/park on Lower I would completely agree with (or on Middle, I’ve often seen CTA buses idling there between Columbus and LSD just before afternoon rush hour). The charters should be loading/unloading in the loading zone further up Upper. It is truly amazing that There is a city under the city just for deliveries and this still happens with impunity. Yes, this section of upper Randolph is like this (i.e. bike lane filled with cars, trucks, buses) almost every time I’ve ridden it. Let’s do something about this, CDOT! Grand Avenue between St Clair and Dearborn is also like that. There haven’t been a single day where I didn’t have to go around vehicles parked, delivering or dropping off on the bike lane. Sometimes I question the logic and point of putting the bike lane in places like that. It feels safer to ride on the car lane and going with the flow rather than constantly zig-zaging and trying to merge. Does anyone at CDOT rides a bicycle? It’s too bad the city doesn’t invest in camera enforcement or at the very least ticket people based on citizen photo submissions. Also a city behind the city with Chicago’s network of alleys. I’d and Washington between State and Michigan to that list. About 2/3 of the flex posts on the Randolph/Franklin right-turn lane have been ripped out. A perfect Uber pick-up zone for the new CNA employees. CDOT doesn’t care. It’s good enough to forward their miles of protected bike lane statistics which is what matters to management.